I met Eric Cohen, winemaker and owner of Justice Grace Vineyards, in May at a cheese-tasting event at the Jewish Community Center of San Francisco. His passion was obvious, but not just for wine. He’s most passionate about using his wine to promote social justice causes to the best of his abilities. To that end, Justice Grace produces two distinctive lines. 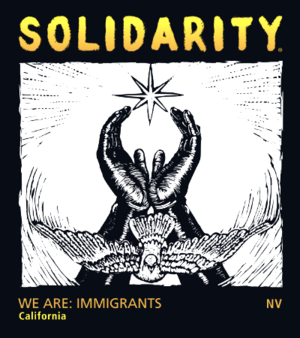 Solidarity Wines currently brings a focus to immigrants though its label art, drawn by Ronnie Goodman, though other oppressed groups will also be highlighted in the future. Shoe Shine Wines, through which Cohen sells his petite sirah from the North Coast, represents the struggle for LGBTQ equality. The wine pictured above, with two male partners dancing together, is one of three options. Two females and a male and female pair are also available, and you can specify whichever you’d like when you place an order. A portion of sales for all of Justice Grace’s wines goes to organizations promoting living wages and other social justice causes. 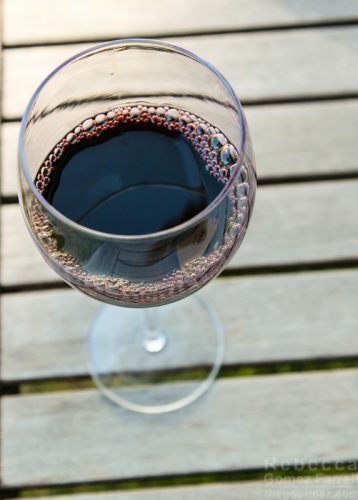 Cohen is also passionate about making natural wines, ones that contain no more ingredients than grapes, yeast and yeast nutrients, malolactic bacteria, and sulphur dioxide. 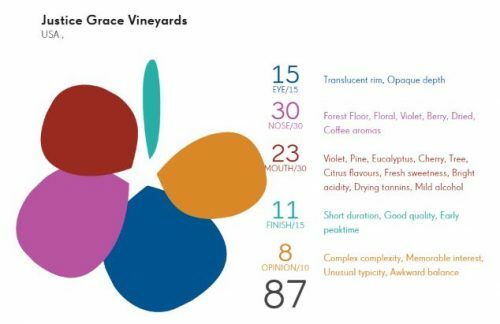 There are no other agents affecting the blend, a choice that I often appreciate as, when done well, the taste of the grapes can come through with a purity on the palate — I’m not sure how else to describe it, but I’ve tasted it a few times. To be honest, I rarely pick out a natural wine on purpose, but the Shoe Shine 2011 Petite Sirah is a great one to try if you’re curious about one done right. Three friends joined me to taste the wine, and we had quite different reactions overall! Friend #1 and I reveled in the nose, which he described as blackberry with night-blooming jasmine. Friend #2 wrinkled his own at the nose, thinking it smelled too acidic. But after drinking the wine, he went on to give one of my favorite tasting notes ever, saying “It comes on strong, but pulls back to smooth just like my dog when guests come over.” Friend #3 gave a succinct, “It tastes good,” before later adding that chewing the wine enhanced its tart elements. The purple hue draws you in for a sniff, and a blue iridescence catches your breath. Inky violets and full berry seduce to a sip. The blossom bears nectarine and rhubarb fruit. Seeds of ancho chile and annatto burst forth into dandelion stem. You have witnessed a new plant’s lifecycle. 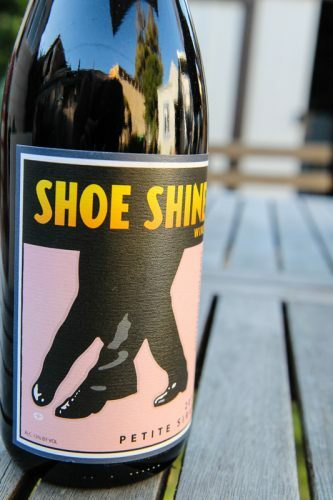 You can purchase the 2011 Shoe Shine Petite Sirah for $35 directly from the website. I don’t normally spend that much on wine, but after tasting it at the cheese event, I knew I wanted to linger over it for longer. There’s also a very intriguing 3-year vertical available for $100….anybody want to buy me a present? I am always impressed when I see winemakers using their craft to inspire positive change in the world. I hope I get a chance to try the wines one day! Great blog! I love the avocado rating system. Also, thanks for bringing this wine to my attention — I’m a fan of good Petit Sirah, and hey, if it has two dudes dancing together on the label, so much the better.